Welcome to Connecticut Wells Inc. Founded in the mid-1960s, Connecticut Wells has grown from a single drill rig water well driller into a state-of-the-art geothermal well drilling operation. As a leader in geothermal drilling throughout Connecticut, New England and eastern New York, Connecticut Wells services everything from residential geothermal installations using two or three wells and commercial installationssuch as large municipality projects with 50 or 60 wells. We regularly manage 250-foot closed-loop projects to 2,000-foot standing column wells. 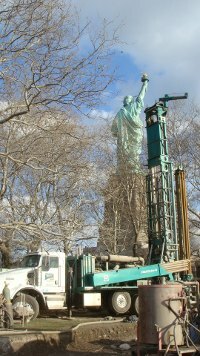 Connecticut Wells is the geothermal well driller of choice for more than 400 homeowners and architects throughout Connecticut (CT) and New York (NY). Connecticut Wells uses the most modern well driller rigs and technologies to operate safely, efficiently and cost-effectively. From well driller rigs to grout trucks to support vehicles, every vehicle in our fleet reflects the pride and professionalism Connecticut Wells demands. Watch the video of the project currently underway.